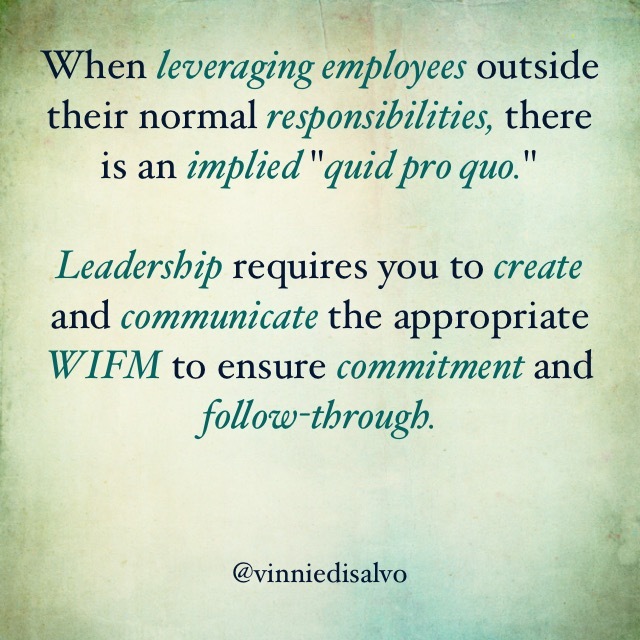 When leveraging employees outside their normal function, there is an implied “quid pro quo.” Leadership requires you to create and communicate the appropriate WIFM to ensure commitment and follow-through. 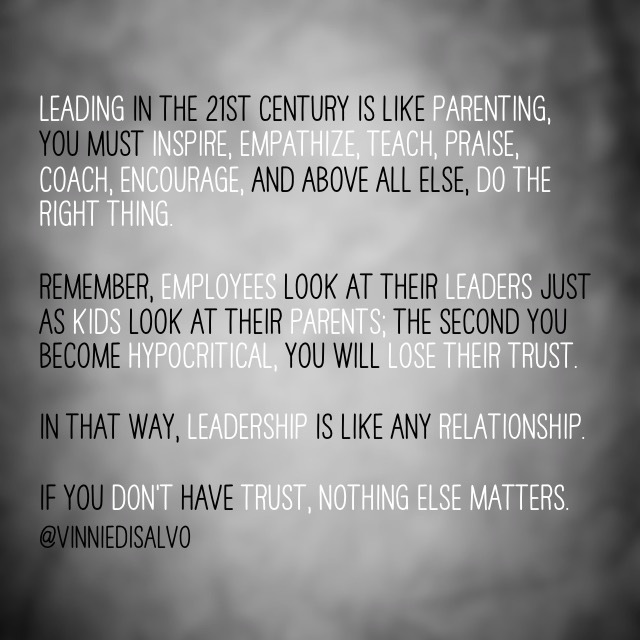 This entry was posted in Leadership, Talent Management and tagged Leadership on February 24, 2015 by Vinnie. 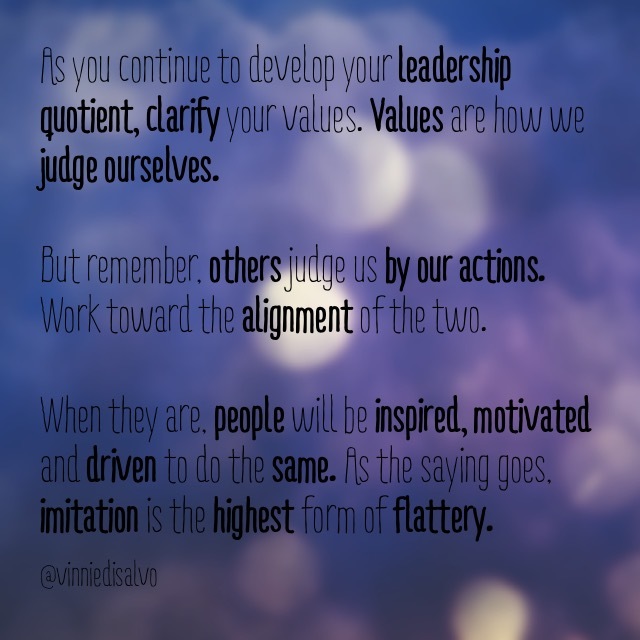 Clarify your #Values. Values are how we judge ourselves, others judge us by our #actions. Make sure they are aligned. 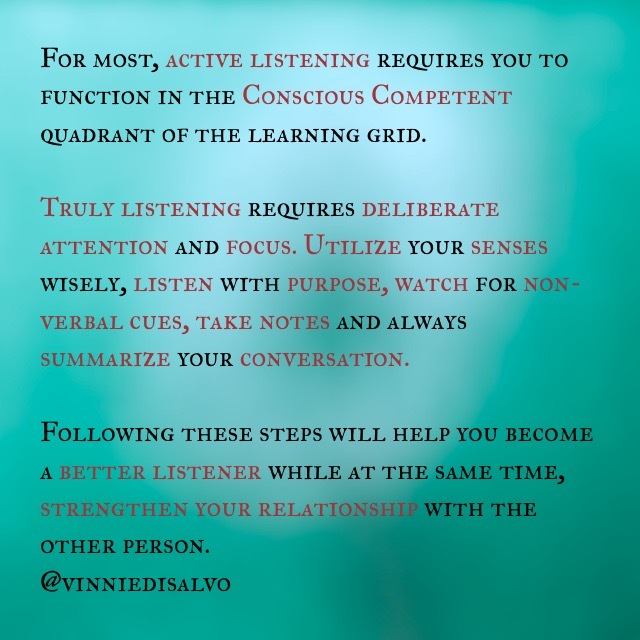 This entry was posted in Leadership, Personal/Professional Development and tagged Actions, Values on February 12, 2015 by Vinnie. The secret to success is hard work achieved through Practice, Preparation, Positive Attitude and Personal Pride. What have you done today to ensure your success? 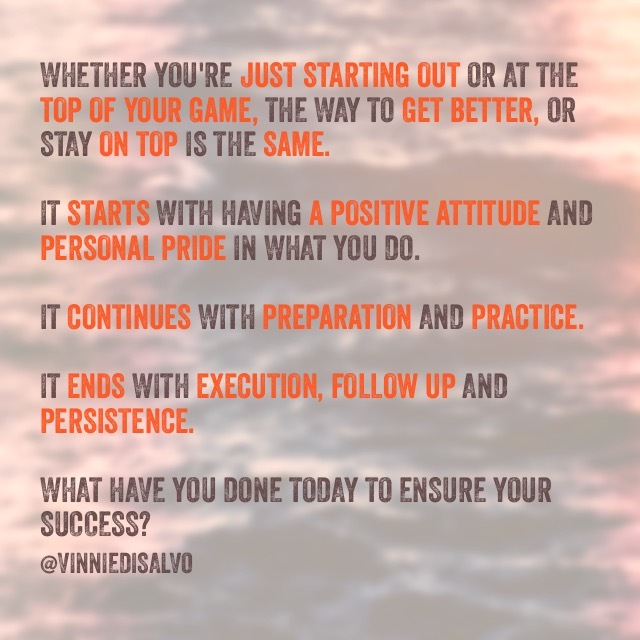 This entry was posted in Customer Service, Leadership, Personal/Professional Development, Sales, Talent Management, Training and tagged Hard Work, Personal Pride, Positive Attitude, Practice, Preparation, success on February 11, 2015 by Vinnie. To Lead you must Inspire, Empathize, Teach, Praise, Coach, Encourage, and above all else and Do The Right thing. 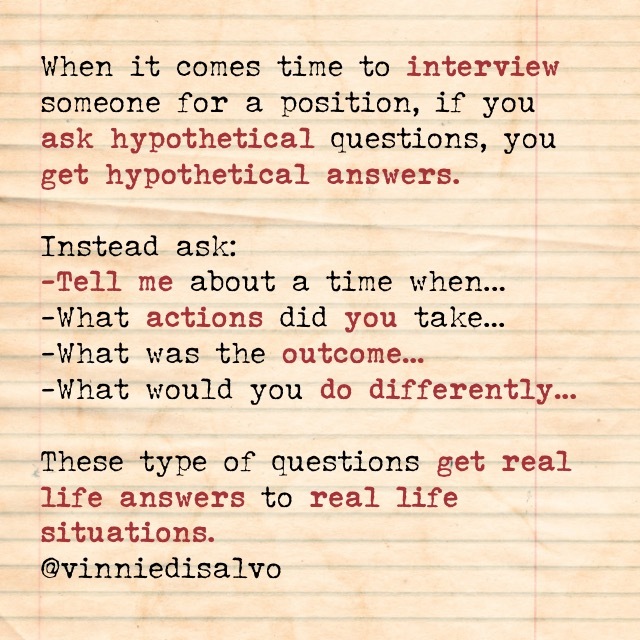 This entry was posted in Leadership, Personal/Professional Development and tagged Coach, Do The Right thing, Empathize, Encourage, Inspire, Praise, Teach on February 8, 2015 by Vinnie. It’s quite special to work for an organization that commits itself not only to it’s customers, but more importantly, it’s employees. Oldcastle is one of those companies. They are dedicated to finding and sharing stories of hope, service and goodwill throughout the organization. As leaders, it’s important to Serve, Inspire and Recognize. I am proud of our organization. Prouder of our leaders. Proudest of our people! This entry was posted in Leadership and tagged Leadership, Recognition, Service on February 6, 2015 by Vinnie. Engage a Mentor with a Short-Term Project – Karie Willyerd – Harvard Business Review. By creating short term stretch assignments for key talent, you can maximize not only the leaders time, but also the return on the interaction. This entry was posted in Leadership, Personal/Professional Development, Talent Management, Training and tagged Leadership, mentor, projects on April 26, 2014 by Vinnie. A few years ago I read an article online regarding organizations and social media. The crux of the article dealt with organizations being paralyzed to jump head first into social media. At the time of the article, the inability for organizations to moderate and control how people responded to their messages and what was posted, stifled their desire to act. The article urged companies to relinquish their control issues and join the new world in creative commentary of their own. The below video is a perfect example how Honey Maid embraced this challenge and made proverbial “lemonade from lemons”. Good on you Honey Maid – this should be an inspiration to all companies. Honey Maid: Love – YouTube. This entry was posted in Customer Service, Leadership, Sales and tagged Communication, Customer Service, Social Media on April 4, 2014 by Vinnie.